Additional research provided by Robert Blair Vocci. Formally established by the colonial government, towns began appearing in eastern North Carolina in the early eighteenth century. By definition, the word "town" was initially applied to population centers "larger than a village but smaller than a city," but as time passed, the words "town" and "city" came to have identical meanings in North Carolina and are now legally interchangeable. Consequently, a municipal government in North Carolina is covered by exactly the same laws regardless of whether it is called a town or a city. Among the first towns to be established in the state were Bath in 1705, New Bern in 1710, and Edenton in 1722, all of which were located near rivers with sufficient channel depth to accommodate the largest vessels able to navigate the sounds and adjacent waters. As settlement spread, larger concentrations of people were usually found in the vicinity of seaports, trading centers, and county seats, thus calling for the provision of services and facilities not needed in sparsely populated areas. Municipal governments were subsequently formed to maintain the roads, public wells, health and safety ordinances, and volunteer fire departments and town watches. Acts authorizing the establishment of new towns often set aside land for public wharves, courthouses and jails, and occasionally common areas (the forerunners of public squares and parks). Unlike their northern counterparts, however, North Carolina cities and towns were slow to industrialize, and features such as water systems and police departments were late additions. Townships were first established in North Carolina with the adoption of the Constitution of 1868, which called for a new plan of local government known as the Township and County Commissioner Plan. Borrowed from Pennsylvania, the plan divided each county into townships, with the voters in each electing two justices of the peace and a clerk to serve as the governing body. These township boards were given control of roads and bridges within their jurisdiction, as well as taxes and finances, and had the responsibility of assessing taxable property for final action by the county commissioners. The clerk of the board served as treasurer of the township and was elected for a two-year term, as were the justices of the peace. Other township officials included a three-member school committee and one or more constables. Townships were convenient administrative subdivisions, particularly for the purpose of building and maintaining roads, although by the early twentieth century they were viewed as little more than "geographical expressions," stripped of all corporate powers. By that time most justices of the peace were appointed, either by the legislature or the governor, and their judicial powers were limited to misdemeanor criminal cases and civil cases involving no more than $50. It seemed that the bold township experiment of 1868 had run its course. Towns and cities themselves continued to grow in North Carolina in terms of both area and population, and developments such as water and sewer systems, telephones lines, street lighting, and public transportation were introduced-first as private franchises and later as publicly owned utilities. Municipal governments organized school districts, built libraries, and oversaw the paving of streets for automobile usage. Although the Great Depression momentarily halted the expansion of cities and towns, the state provided assistance for roads, libraries, and education, and public works programs designed to combat unemployment resulted in many municipal improvement projects. Legislation enacted in 1959 allowed municipal governments to annex adjacent urban territories and empowered them to zone and regulate land development. In the 1970s environmental protection measures were also adopted. As the twentieth century drew to a close and a new century dawned, most cities adopted the council-manager form of government-by which a council, presided over by the mayor, creates municipal policy and appoints a manager as chief administrator. By the early 2000s, half of North Carolina's population resided in towns and cities, with the state's municipal population growing at an unprecedented rate. David M. Lawrence and Warren Jake Wicker, eds., Municipal Government in North Carolina (1996). Paul W. Wager, County Government in North Carolina (1928). 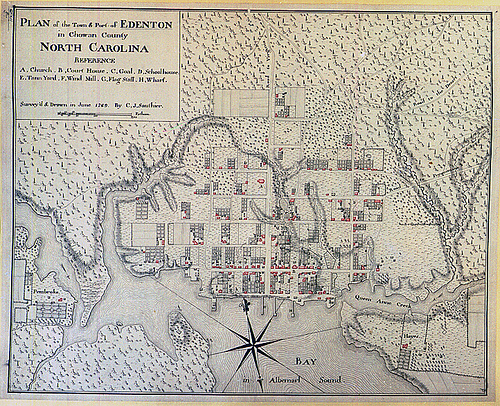 Plan of the Town of Edenton 1769, by C. J. Sauthier. Original in British Library, London. This copy from General Negative Collection, Non-Textual Materials Unit, North Carolina State Archives, call #: T_84_6_5, Raleigh, NC. Available from http://www.flickr.com/photos/north-carolina-state-archives/3059157494/ (accessed November 20, 2012). 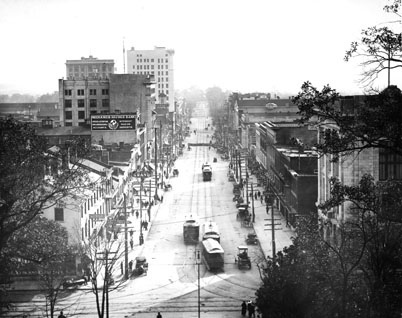 Elevated view of Fayetteville Street, Raleigh, NC, looking south showing the main business district, 1913. From Carolina Power and Light (CP&L) Photograph Collection, North Carolina State Archives, call #: PhC68_1_90. Available from http://www.flickr.com/photos/north-carolina-state-archives/2340423433/ (accessed November 20, 2012).